The Macdonald Seamount Fig. 10.1a is located at the tip of the Austral hotline (Johnson 1970, 1980; Talandier and Okal 1984). The activity of the Austral and Society hotspots has been closely monitored by the detection of seismic swarms recorded by the French Polynesian seismic network (“Réseau Sismique Polynésien”, RSP). Since the Austral Islands are too far away from the receiving stations, only ‘T’ waves have been detected from the Macdonald Seamount (Talandier and Okal 1984; see Sects. 2.4.1 and 2.4.2). This seamount is one of the most active submarine volcanoes in the world (Cheminée et al. 1991) and was first noticed after a strong seismic swarm was detected by the hydrophones of the Hawaiian Institute of Geophysics Network (Norris and Johnson 1969). 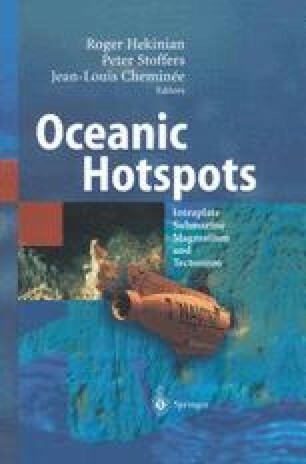 A multibeam bathymetric survey (NO JEAN CHARCOT, FS SONNE and NO L’ATALANTE) of the most recent seamounts of the Society and the Austral hotspots was undertaken in 1986 and 1987. The edifices were also sampled, and several dredge hauls were undertaken on top of the Macdonald Seamount Fig. 10.1b. Related publications have mainly dealt with the morphology and the structure of the Society and Austral hotspots and the petrology of the volcanics (Stoffers et al. 1989; Sect. 5.3.1.1; Hekinian et al. 1991). Among the samples recovered from the Macdonald Seamount, highly vesicular pillow lavas, volcaniclastics and accidental rock debris were found. The gabbroic clasts were ejected during hydromagmatic explosive events nearly twenty years after the seamount was first discovered. Later, they were partially covered by basanite lapilli during further explosions (Sect. 5.3.1.1; Hekinian et al. 1991).